2 Much of the recent growth in the foreign-born black population has been fueled by African migration. Between 2000 and 2016, the black African immigrant population more than doubled, from 574,000 to 1.6 million. Africans now make up 39% of the overall foreign-born black population, up from 24% in 2000. 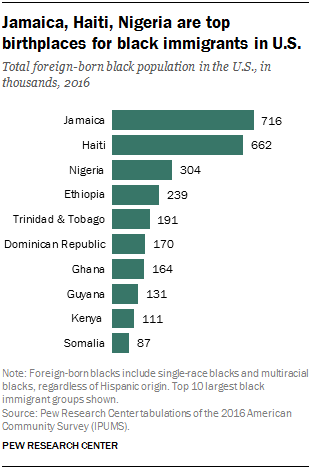 Still, roughly half of all foreign-born blacks living in the U.S. in 2016 (49%) were from the Caribbean, with Jamaica and Haiti being the largest source countries. 3When compared with other immigrant groups, blacks are more likely to be U.S. citizens or to be proficient English speakers. Roughly six-in-ten foreign-born blacks (58%) are U.S. citizens, compared with 49% of immigrants overall. And given that many black immigrants are from English-speaking nations, black immigrants ages 5 and older are also more likely than the overall immigrant population to be proficient English speakers (74% vs. 51%). 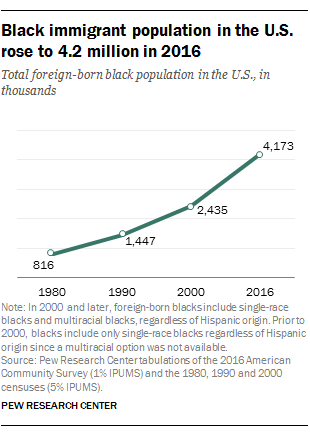 4There were 619,000 unauthorized black immigrants living in the U.S. in 2015, accounting for 15% of foreign-born blacks, according to Pew Research Center estimates. By comparison, 24% of the overall immigrant population is unauthorized. 5 Overall, black immigrants (28%) are somewhat less likely than the overall U.S. population (31%) to have a college degree or more, but black immigrants from Africa are more likely than Americans overall to have a college degree or higher. But educational attainment varies widely by country of origin. For example, 59% of foreign-born blacks from Nigeria have a bachelor’s or advanced degree – a share that is roughly double that of the overall population. By comparison, just 10% of black immigrants from Somalia have earned at least a bachelor’s degree. 6In 2016, 8% of blacks were second-generation Americans – meaning they were born in the U.S. but have at least one foreign-born parent, according to the Center’s analysis of the Census Bureau’s 2016 Current Population Survey. In total, black immigrants and their children make up roughly one-fifth (18%) of the overall black population in the U.S.